Do you want to use stories more effectively to captivate your audience and make more money? Would you like to turn one powerful story into a million dollar speaking, training and consulting business? Stop giving boring presentations that fail to connect on an emotional level. Stop doing data dumps that put people into a content coma. Stop telling yourself that people don’t want to hear your stories. No more excuses! No one else has your stories. No one else can share the knowledge and wisdom that you have from your life experiences. If you have a story to tell, it’s time you learn how to tell it. You can learn how to become an amazing storyteller without spending tons of money. Did you know that you can now learn the secrets of masterful storytelling from the comfort of your home or office? It’s quick and easy. And you don’t need to spend money on airfare and hotels to do it. Click to watch the FREE DEMO VIDEOS now. Being a better storyteller can help you reach your career goals faster than any other skill you could acquire. Becoming a better storyteller might be the best investment you ever make! Stories are products. People buy them just like they would buy any worthwhile product. They have monetary value. If your story isn’t selling you, it may not be the story that’s the problem. You may not know how to tell it. In the beginning of my speaking career I had one really great story. On the strength of that one story I built a million dollar speaking business. I developed The Story Theater Method for strategic storytelling in business based on the techniques I used to develop and perform that story. You can become a professional speaker or a more inspiring leader by simply being able to tell your stories better. Your story can change people’s lives, and bring you hundreds of thousands of dollars in income at the same time. Have you ever watched a professional speaker tell an amazing story and thought to yourself, “I could to do that?” Professional speakers get paid $5,000 to $25,000 and more, per speech. That’s money in the bank! Have you ever been passed up for a promotion by a less qualified person because he or she was a better speaker and storyteller? If you’re in line for a promotion, your storytelling ability will give you a competitive advantage. That’s money in the bank! When you tell a brilliantly-crafted and performed story, people who hear you will think, “My people need to hear that story.” They’ll come up to you after your presentation and ask for your business card so they can book you, and refer you. That’s money in the bank! Or perhaps you’re a Toastmaster and you want to win your local, regional or World Championship competition. Your story, and how you tell it, can set you apart and help you achieve success. Well I’ve finally done just that! Now there is an easy and simple way to learn how to tell your stories in a way that inspires people, gets more referrals from every speech and allows you to increase your speaking fees. I’ve created a video series that gives you everything you need to know about the three secrets to next level storytelling. 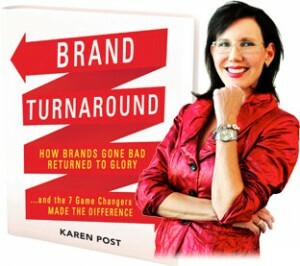 “We know that storytelling is the cornerstone for any speaker or executive getting great results from the platform. Doug Stevenson provides an easy, step-by-step, formula for taking your presentations to an entirely new level. This video series is a “must watch” for anyone who wants to improve their platform and storytelling skills, I would highly recommend this investment in your career. You came to this page looking for a solution. You probably already have solid content, excellent public speaking skills, and good stories. But, you know those stories need to be better – they need to be amazing to get you where you want to go. In this self-paced, online video learning series, you’ll get everything you need to learn how to choose, craft and deliver amazing stories. 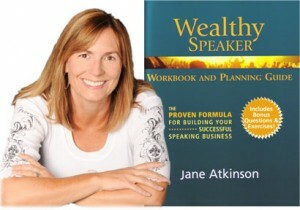 You’ll learn how to go from speaking for free to charging high fees. You’ll learn how to be funnier and more dramatic, how to connect on a deep emotional level with your audience and how to set yourself apart in the marketplace. Why would you even think of giving your next speech with the “same old – same old” that you have been doing? 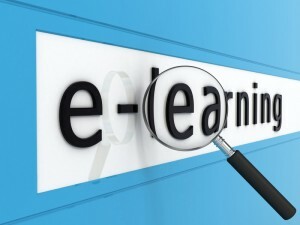 Take advantage of this career-changing learning resource right now. Your next speech can be the best speech you’ve ever given. 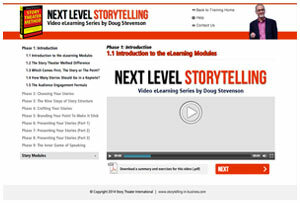 containing clips from the Next Level Storytelling Video eLearning Series. With the Next Level Storytelling Video eLearning Series, you’ll get the full series of video tutorials, divided into Nine Phases, plus bonus videos, summaries and exercises to choose, craft and perform your amazing, million-dollar stories. If you are interested in placing this Video eLearning Series on your company’s LMS, please contact us for bulk purchases of the Next Level Storytelling Video eLearning Series.